Green Tea and Velociraptors | They might be giants, but how could they live with each other? EGU Blogs » Network » Green Tea and Velociraptors » They might be giants, but how could they live with each other? They might be giants, but how could they live with each other? 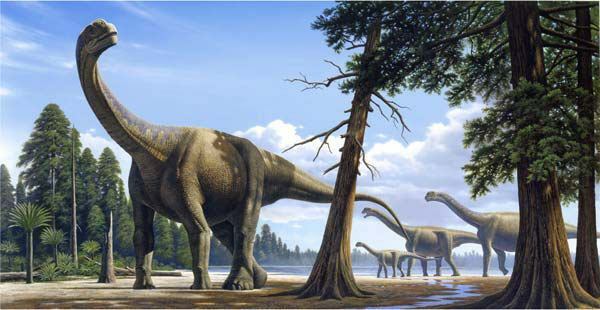 Sauropod dinosaurs are the biggest animals to have ever walked on land. They are instantly recognised by their long, sweeping necks and whiplashed tails, and nearly always portrayed moving in herds, being stalked by hungry predators. In recent years, a huge amount of taxonomic effort from scientists has vastly increased the number of known species of sauropod. What we now know is that in many areas we had two or more species co-existing alongside each other. A question that arises from this, is how did we have animals that seem so similar, and with such high energy and dietary requirements, living alongside one another? Was there some sort of spinach-like super plant that gave them all Popeye-like physical boosts, or something more subtle…? David Button, from the University of Bristol, has been trying to figure this out as part of his PhD research (less emphasis on the Popeye side, though). By looking at two sympatric species (those that lived together) from the fossil graveyards of the Late Jurassic of North America (about 150 million years ago, in what is now known as the Morrison Formation), he tried to work out what the major dietary differences were between sauropod dinosaurs, based on their anatomy. This period of time is especially unusual, as there are around 10 currently named sauropod genera living alongside the usual theropod and ornithischian suspects from this time period. Of this great number, it is known that they occurred in clusters, with sometimes 3-5 genera co-existing in the same time and space – the Morrison Formation is pretty massive (6 million km2) and covers a period of about ten million years. These sauropod genera, which were anything from 7-47 tonnes in weight, lived in a region that was prone to aridity, and known for being particularly resource poor in terms of plant productivity. How on Earth did this environment sustain them? To address this, Button created three-dimensional reconstructions of the skulls of two iconic sauropods, Camarasaurus and Diplodocus. Based on these, he was able to compute where the muscles relevant to eating would have been, and calculate the different forces involved in chewing food. 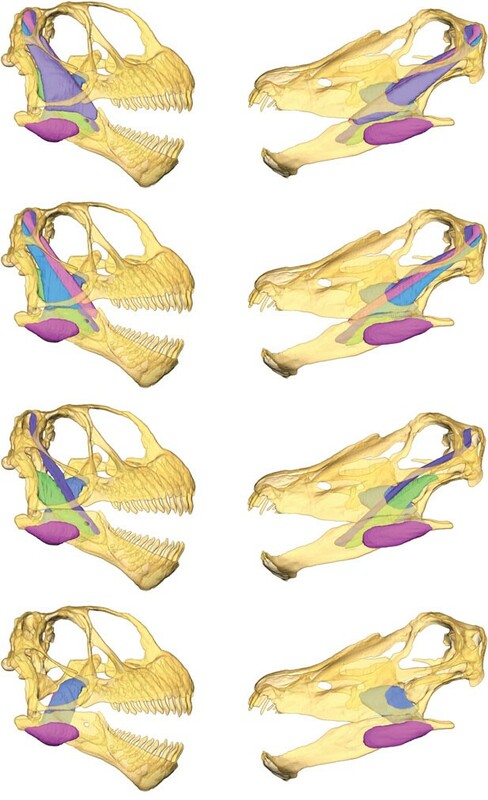 Alongside this, he measured a series of aspects of the dinosaurs’ morphology relevant to mastication (fancy word for chewing) to see if it was possible to quantify biomechanical variation in a range of different species. What he found was not exactly unexpected based on previous research, but taking it to a whole new level using sophisticated new techniques. 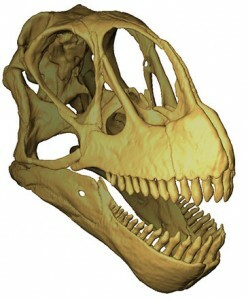 Camarasaurus, with its more mechanically efficient skull, was capable of generating much stronger bite forces than Diplodocus. This suggests that Camarasaurus was capable of chomping through tougher plant material than Diplodocus, and was perhaps even capable of a greater degree of oral processing before digestion. This actually ties in nicely with previous hypotheses of different diets between the two based on apparent feeding heights and inferences made from wear marks on their fossilised teeth. Diplodocus seems to have been well-adapted, despite its weaker skull, to a form of feeding known as ‘branch stripping’, where leaves are plucked from branches as the teeth are dragged along them. The increased flexibility of the neck of Diplodocus compared to other sauropods seems to support this too. 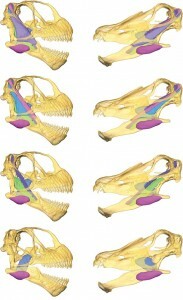 In terms of their morphological disparity (differences in mechanically-significant aspects of their anatomy), Camarasaurus and Diplodocus appear to vary more than almost any other sauropod taxa, representing extremes within a spectrum of biomechanical variation related to feeding style. Rather nicely, all the other sauropod species from the Morrison Formation seem to occupy different regions along this spectrum. This strongly suggests that different skull mechanics existed between all the co-existing species, which enabled them to exploit resources in a range of different ways. This would be similar to how we have such a range of diverse and large herbivorous mammals in the modern day Serengeti. Dietary specialisation and foraging ability, therefore, seem to have been extremely important in what is known as ‘niche partitioning’ in sauropods – the occupation of different roles in an ecosystem by different organisms. The potential implications for what this means in terms of their gigantic sizes and prolonged evolutionary success, however, is a story that still remains to be told.